Team Futaba Signs Bari Musawwir « Big Squid RC – RC Car and Truck News, Reviews, Videos, and More! The crew over at Futaba have sent out a press release with their latest driver signing, Bari Musawwir. While Bari is a professional full sized monster truck driver, he is also big into the hobby of rc cars. 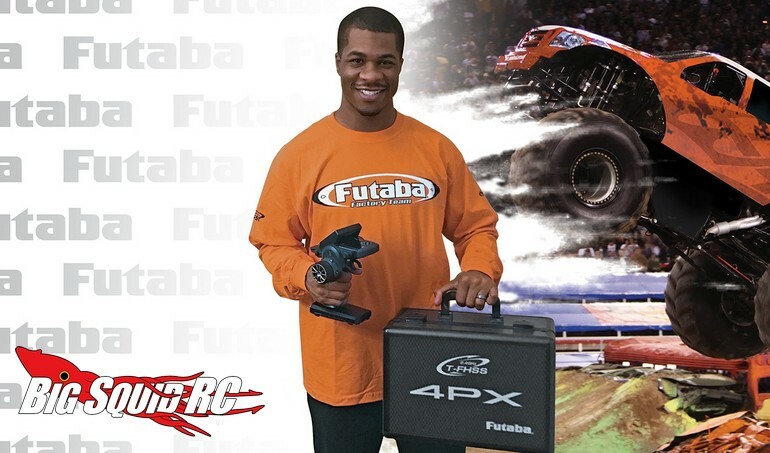 It sure is cool to see Futaba sign Bari and it was interesting to read in the press release how he uses some of his rc car experience to help set-up his full sized rig. “Champaign, IL, March 23, 2017 – Bari Musawwir, a professional monster truck driver, is joining Team Futaba. For him, the combination of RC and full-scale professional driving is fulfilling a lifelong dream. Musawwir is getting to do exactly what he dreamed of as a kid. He grew up in Cleveland Heights, Ohio, building plastic models, drawing and designing his own cars, and modifying them. When he got a little older, he started racing RC cars competitively. With a career that has taken him to many countries, earned him awards, and will undoubtedly provide insights into upcoming RC races with Team Futaba, Musawwir really is living the dream. Hit up This Link for all the latest Futaba news on BigSquidRC.